Red Heart Comfort is the most economical yarn that I have come across so far. It is available in large balls for just under $10.00CAD. It is very similar to Red Heart Super Saver, but it comes in much larger balls and is slightly thicker. The yarn is great for making afghans, slippers, hats, bags and other accessories. You can even use this yarn to crochet up clothing items; when used with the right hook it’ll drape fairly well especially after it is washed. The yarn is 100% acrylic, which might not be suitable for those with sensitive skin. Also, the yarn is not soft and might not be suitable for baby items either. And if you like your yarns to be super soft as you are working with it, then this might not be your first choice. Nevertheless, if you do a lot of crocheting for charity and don’t mind working with it, then this yarn might be the perfect choice. The good news is that the yarn is easy to take care of and doesn’t fuzz much after washing. It also softens up quite a bit after the first wash. So unlike many other yarns that can be ruined in the wash, this yarn actually improves with washing. Red Heart yarns are popular and available in most yarn stores. Patterns for this yarn can be found at the Red Heart website. I have never seen a pattern directly on this yarn label, but you can find a number of free patterns on their website. 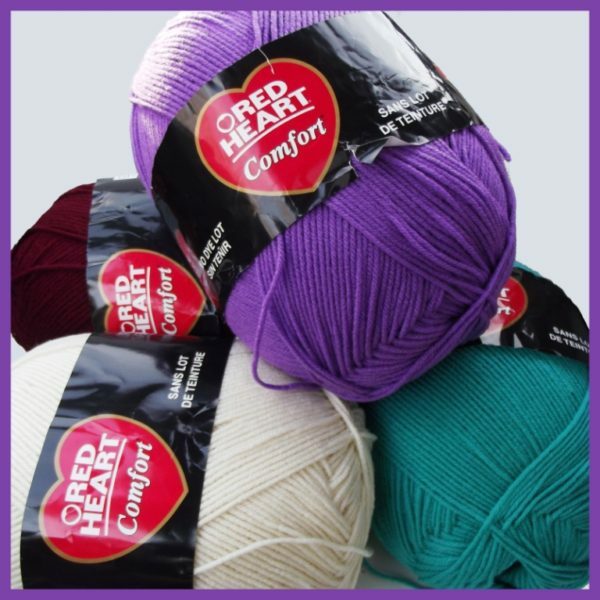 You might also enjoy the free crochet patterns on this site that call for Red Heart Comfort yarn. You can use my amazon affiliate link to purchase some comfort yarn for yourself. You get the same same great deal and I get a small commission.